Your Whirlpool dryer is running, clothes tumbling, but there's no heat. This is probably due to a faulty heating element, something the average do-it-yourselfer can replace. Disconnect the power supply, then refer to the owner's manual for procedures to remove the front panel from your specific model. If your dryer has a toe-kick plate in front, that's all that needs to be removed. Locate the heating element heat shield, a box on the lower right side of the dryer. Using a screwdriver, pull the two screws at the front of the heat shield. Remove the front of the heat shield or, if it is on a hinge, flip it down. Remove the wire leads from the heating element terminals by pulling on the leads. To avoid damaging the wires, do not grab them when you pull off the leads. Remove the holding screw on the side of the heat shield that connects to the heating element. Remove the heating element by sliding it out of the heat-shield box. Install a new heating element and secure it to the heat shield with the holding screw on the side. Reconnect the wire leads to the new heating element by pushing them onto the terminals. Place the heat shield front cover back into position and secure it with the mounting screws. 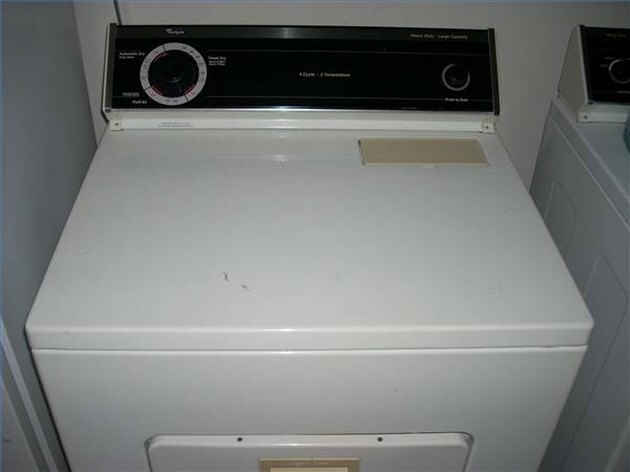 Replace the front panel or toe-kick plate and reconnect the power supply to the Whirlpool dryer.